The Perth Mint has announced the details and revealed the designs for the 2012 Australian Silver Koala bullion coin series. Each year, they have created an original design for the 99.9% silver coins, available in a range of weights. The design for the 2012 Silver Koala features an adult koala, sleeping on a tree branch. 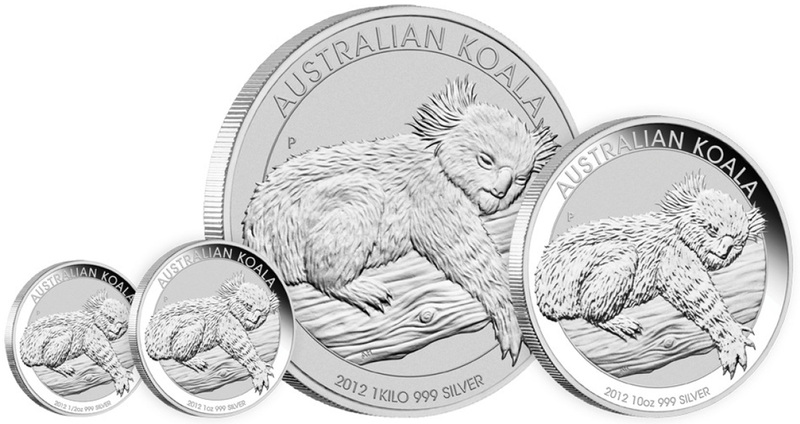 The surrounding inscriptions include “Australian Koala”, the year “2012”, the silver content, and “999 silver”. The Perth Mint’s “P” mint mark is also incorporated into the design. On the obverse is the Ian Rank-Broadley effigy of Queen Elizabeth II and the legal tender face value. The coins will be available in 1 kilo, 10 ounce, 1 ounce, and 1/2 ounce sizes. No mintage limits will apply to the coins for 12 months, although production will close at the end of 2012. All coins are included in protective capsules. The worldwide release date for the 2012 Silver Koala bullion coins will be November 1, 2011. Will there be a 5 oz version like in 2011? Or will that be something they announce later in 2012? Last, year those were announced separately in June. November 1, 2011? Not that I’ve seen. Nothing on the Perth website regarding these coins yet. Any new information? Due to high demand for the 2012 Year of the Dragon Lunar series silver coins and 2012 Silver Kookaburra, the release of the 2012 Silver Koala coins has been delayed. The new release date is January 3, 2012.